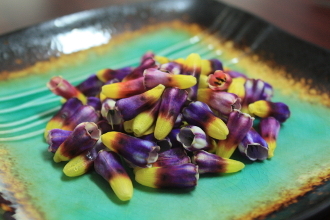 Small bell-shaped royal purple & bright yellow flowers. About 3/4" in length. Mild taste of chocolate. Unique finishing touch to desserts & chocolate drinks. Great topping for strawberry sorbet! Available March through September.